The publication “Dual Effects of Ketoconazole cis-Enantiomers on CYP3A4 in Human Hepatocytes and HepG2 Cells“ was recently published in the respected journal, PLoS ONE (PLoS One. 2014 Oct 24;9(10):e111286, IF2012 = 3.73). Antifungal drug ketoconazole causes severe drug-drug interactions by influencing gene expression and catalytic activity of major drug-metabolizing enzyme cytochrome P450 CYP3A4. 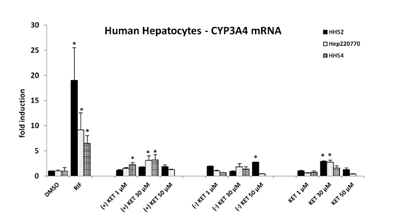 In the current paper, we have examined the effects of ketoconazole cis-enantiomers on the expression of CYP3A4 in human hepatocytes and HepG2 cells and on catalytic activity of CYP3A4 in human liver microsomes. Overall, we show that ketoconazole inhibits enantiospecifically CYP3A4/5 catalytic activity, while its effect on CYP3A4 expression is not enantiospecific.